I hope everyone had a nice Easter. Any day spent with the ones you love is a good day. That and I got to do two of my other favorite things: draw and eat chocolate. Today, according to the creativity journal I usually work from, is do something inspired by insects day. 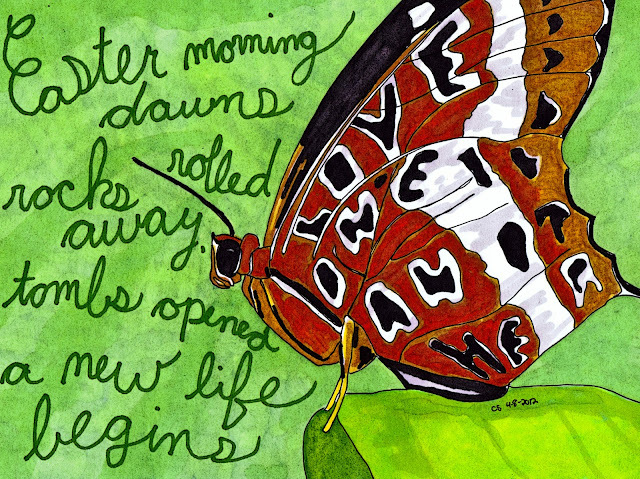 You wouldn't think that would go with Easter, but the whole symbolism of the butterfly "dying" and coming out of its cocoon is a nice metaphor for what happened at the very first Easter. Today's project is also inspired by the project of Yasna Provine which involves a daily poem. I like the structure and simplicity of the haiku so I included one in this pen and marker drawing I just finished. Enjoy and happy Easter!